As the leaves change colors, and the days start getting shorter, winter is just around the corner! Along with winter comes the inevitable colder temperatures, so be prepared and make sure your heating system is up to the task of keeping you warm and comfortable. 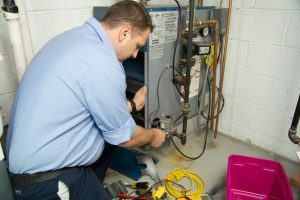 Here’s our Top 5 checklist to ensure your furnace and home are ready for the upcoming winter. 1.Replace your HVAC filter. According to ENERGY STAR®, a government-backed symbol for energy efficiency, you should check your filter every month, especially during heavy use months (winter and summer). “If the filter looks dirty after a month, change it. At a minimum, change the filter every 3 months,” according to ENERGY STAR®. A dirty air filter slows down airflow, causing your system to work harder to keep you comfortable, leading to wasted energy and resulting in higher energy bills. 2. Keep air vents clear. Blocked air vents force your furnace to work harder and less efficiently. Remove any furniture, rugs, plants or toys that will obstruct air flow. 3. Set your thermostat. If you have a programmable thermostat you will want to set it to a comfortable temperature for the times in which you are home. 4. Set your ceiling fans to rotate clockwise. Ceiling fans are a great way to circulate air throughout your home and work great for any season. For cooler months, you’ll want to run your fans in a clockwise rotation. This will force the warm air down and help draw the cool air up. 5. Schedule your HVAC tune-up now. Just as your car needs a tune-up so does your heating and cooling system. For your car, this ensures it’s running safely, efficiently (maintaining good gas mileage) and won’t break down and leave you stranded on the side of the road. The same thing applies to your furnace. You want to make sure it will run safely, efficiently (saving on energy bills) and won’t quit working when you need it most – leaving you out in the cold! Call or go online and schedule your annual furnace tune-up with Best Heating & Cooling. We’ll ensure your furnace is ready for winter – running efficiently, safely and dependably!